Note: Users can also get to the Designer by clicking on any number of store components you've configured to link to the Designer, like the Call To Action component in this example. 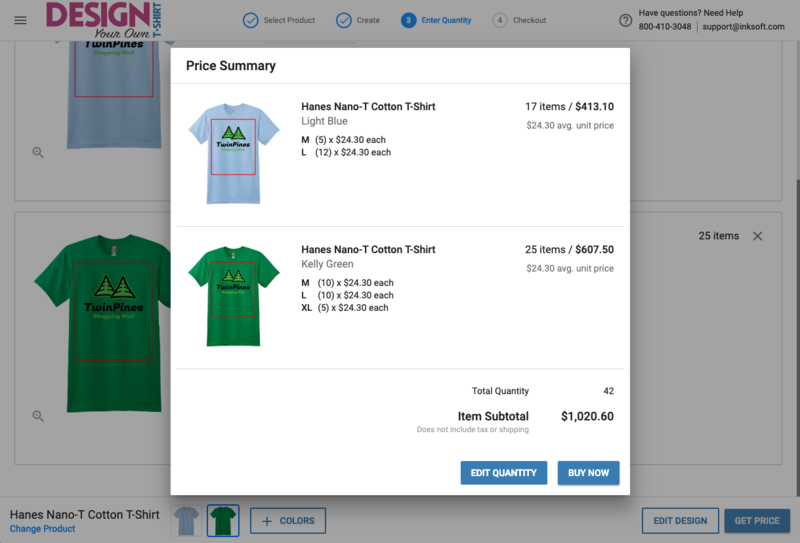 Once the user enters the Designer, they will immediately see your blank product catalog for that store. They can scroll through to see the products you have, and they can also Search and Filter to find the product they want. This is Step 1 of the Designer guided walkthrough. 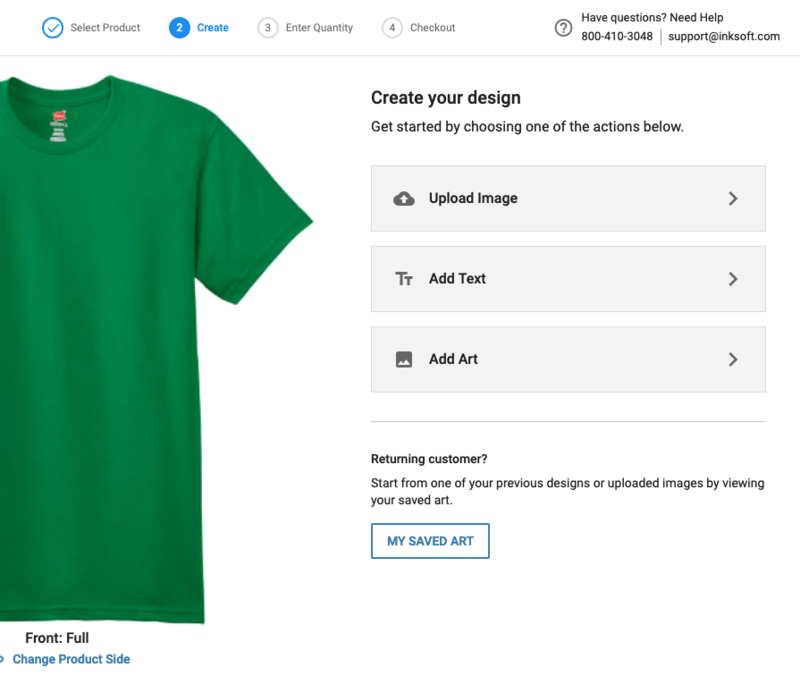 Once the user has chosen their product and product color to start decorating on, they will click on DESIGN NOW to go to the next step, "Create". This will take them into the Designer itself. Note: The user can also get to this function by clicking on "Side" in the toolbar menu on the left. Upload Image - The user can upload a custom image or design. Add Text - The user can add text to their product with the built-in Text function. Add Art - The user can add artwork from the built-in InkSoft Art Libraries, or any custom artwork you have assigned to the store. They can also choose from an existing design they have previously saved. Design Ideas - Multi-layered design templates from the InkSoft Art Library. This may also include admin created Design Ideas. Clip Art - Individual art layers from the InkSoft Art Library that can be added to Design Ideas, Text, or custom artwork. This may also include Clip Art uploaded by the admin. My Saved Art - If the user is signed in with a User Account and they have previously created and saved their designs, they can choose from those as well. Select All - Selects all current art and text. Clear - Clears all current art and text. Zoom - Allows the user to zoom in to the design area for a closer view. The user will be asked to name and save their design again (or name and save it for the first time if they had not saved the design previously). They can then click on "ADD TO CART" to add those items to their shopping cart and continue to the next step. The next screen will show that the items have been added to their cart, and they can View Cart or Continue Shopping. If the user wants to add more items to their cart, they can click Continue Shopping. This will take the user to the home page of your store. If the user chooses to View Cart, then they will be able to review their Shopping Cart and all the items. When they are ready, they can click PROCEED TO CHECKOUT and continue placing their order. The Designer experience is now complete! Home - Your store's home page. Design Now - Takes the user to the first step in the Designer process. Contact Us - Lets the user contact you via the store's Contact Us form. My Account - If the user is signed in with a User Account, they can access their account details. Cart - Lets the user jump directly to their Shopping Cart. Note: The user can also click on the Store Logo to get to the store's home page.